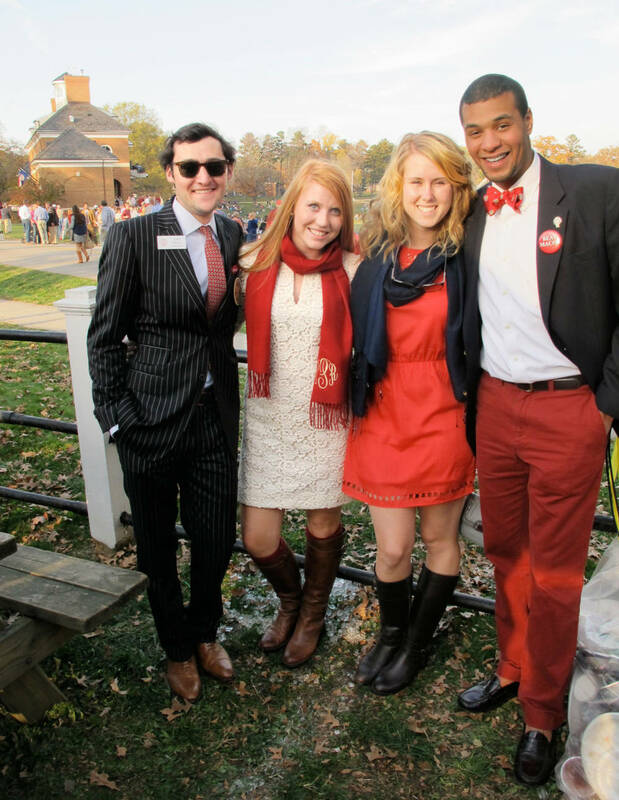 I’ve listed Hampden-Sydney again this year as the most preppy college in the South. It was founded in 1775, when George III was King of England, Virginia was a British colony and the Declaration of Independence was yet to be written. 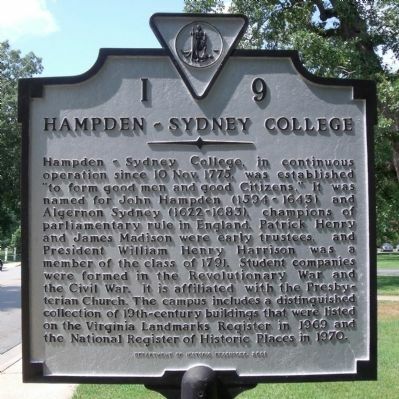 One of only four all-male colleges remaining in the United States, Hampden-Sydney counts Patrick Henry and James Madison as two of its original Board of Trustees members. 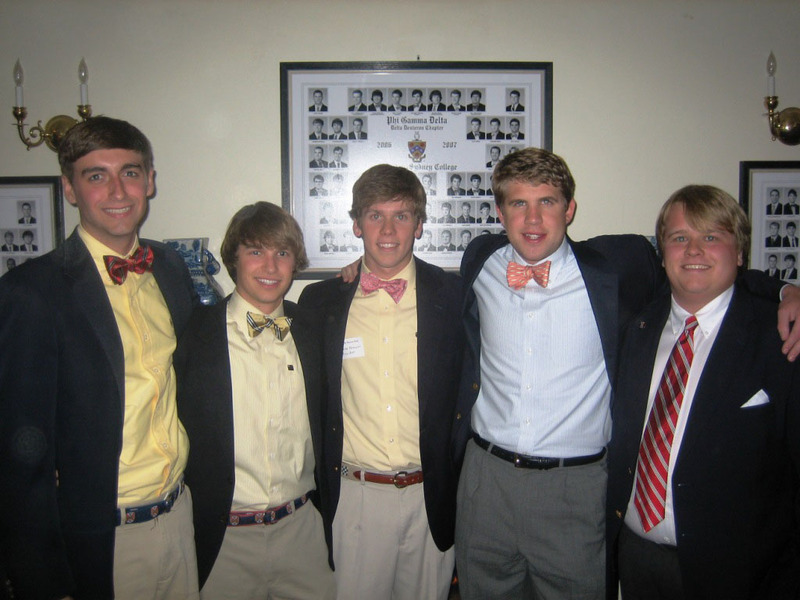 Students at Hampden-Sydney take a great deal of pride in their appearance and believe in good manners. In fact, the school has published its own etiquette guide: To Manor Born, To Manners Bred (now in its 7th edition), which has been updated for the social media age. That’s serious dedication! Some gentlemen of Phi Gamma Delta fraternity above display a range of attire: plain front khakis, blue blazers, a navy suit with a Brooks Brothers repp tie, freshly pressed pinpoint and oxford cloth button downs, bow ties, ribbon belts with motifs and a needlepoint belt. 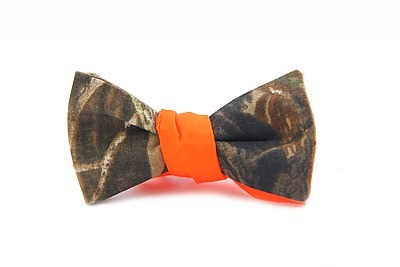 This is all standard dress on campus, and one of the reasons Hampden-Sydney is considered a very traditional college. 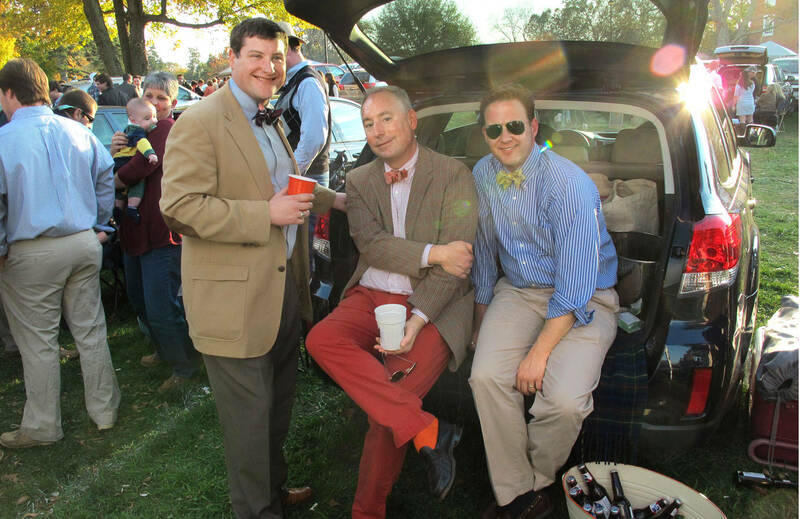 In the February 2013 issue of Town & Country, Hampden-Sydney alumni were featured tailgating on campus prior to a football game against arch rival Randolph Macon. All of these gentlemen are sporting bow ties, and one is wearing Nantucket Reds with a pair of go-to-hell socks that would make President George Herbert Walker Bush envious. 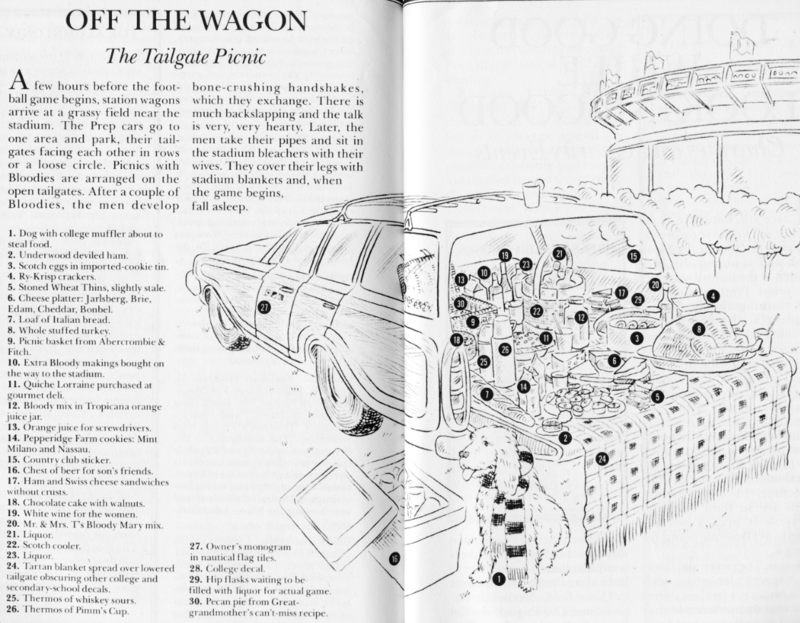 Tailgating was spoofed in Lisa Birnbach’s The Official Preppy Handbook (1980) in which she also listed Hampden-Sydney as the #3 preppy college in the country behind Babson (#1) and Hamilton (#2). 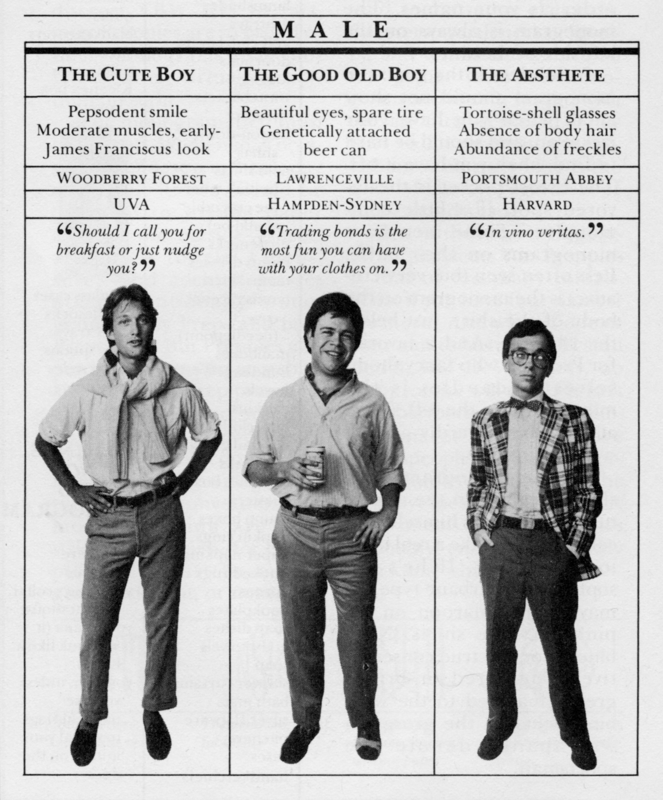 Also in The Official Preppy Handbook, noted both for its finely drawn satire and anthropological treatment of preppies, is a section on body types with representative photos and descriptions of each. The Good Old Boy’s biography includes attending Lawrenceville and Hampden-Sydney, and his stated attributes suggest a fun-loving, if not bawdy, demeanor. He is holding a “genetically attached beer can,” while wearing a button down layered over a Lacoste shirt (Southern collar notably not popped), rumpled, flood level khakis and a pair of penny loafers, one of which is duct taped to keep the sole and the upper together – a practice cultivated at Lawrenceville. He’s the one of the three I think I’d most enjoy being around. 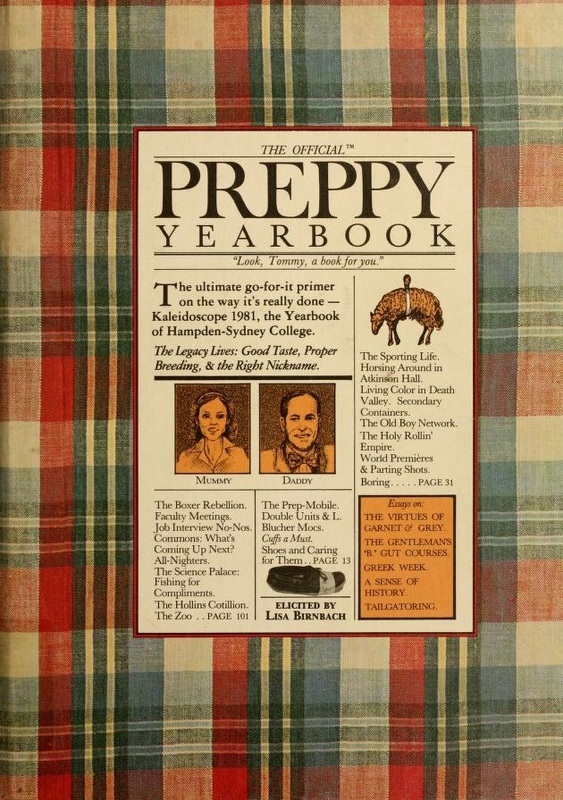 As an homage to Birnbach, whose publication became a national bestseller, the college’s Kaleidoscope yearbook staff responded with The Official Preppy Yearbook. 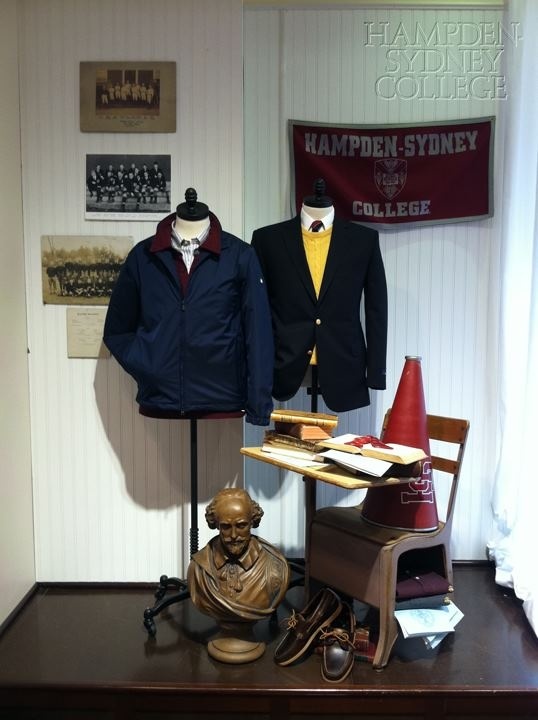 Birnbach visited Hamden-Sydney a few years ago to promote her most recent book, True Prep, in which she elevated the college’s sartorial place, writing,”… allow us to assure you, in no uncertain terms, that Hampden-Sydney is, without equivocation, the preppiest college in the United States.” In fact, one enterprising student there, Samuel Thomas, recently co-founded a bow tie company called Dogwood Black (originally Southern Ties) and is now marketing his expanding product line nationally after getting requests from upscale men’s clothiers. Dr. Christopher B. Howard, Hampden-Sydney’s 24th president, is a graduate of the U.S. Air Force Academy. This gentleman was a Rhodes Scholar at Oxford University, where he earned a Master of Philosophy and a Doctorate of Philosophy in Politics. He also holds an MBA from Harvard Business School. Howard is the first African-American president in the college’s history, and he is proudly a Brooks Brothers man. 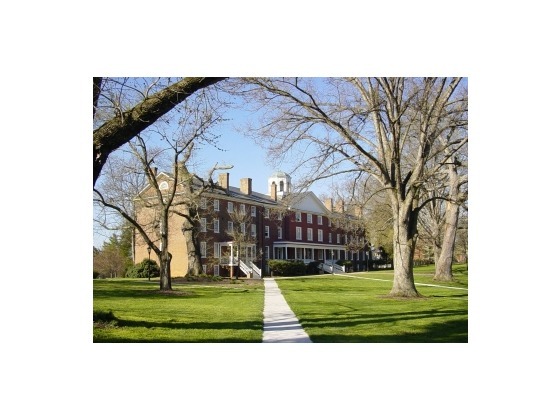 In 2010, Hampden-Sydney entered into a formal partnership with Brooks Brothers to provide a 15% corporate membership discount to students, faculty and staff of the college. The program is titled “Dressing for Success with Brooks Brothers.” In this YouTube video, President Howard discusses the program and the investment in college education with parents of prospective students at an event hosted in a Brooks Brothers retail store in Richmond, VA.
Now in its third century of operation, Hampden-Sydney has a beautiful campus, an excellent academic reputation, a long tradition and a very loyal alumni base, many of whom contribute substantially to the institution every year. 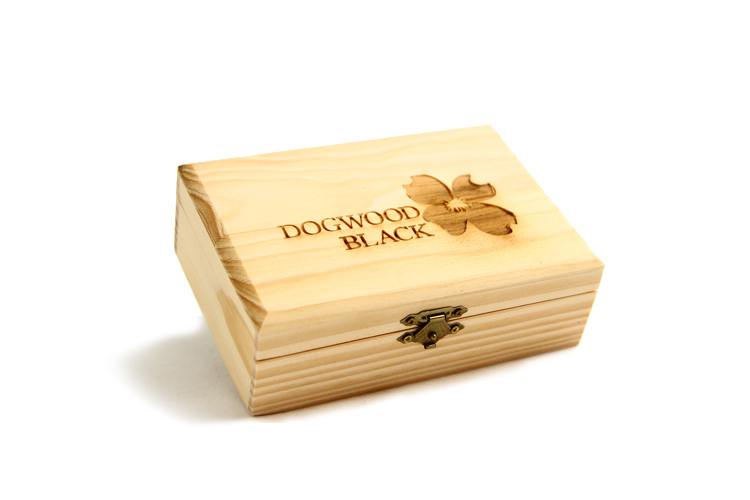 Its past is distinguished, and its future looks secure. 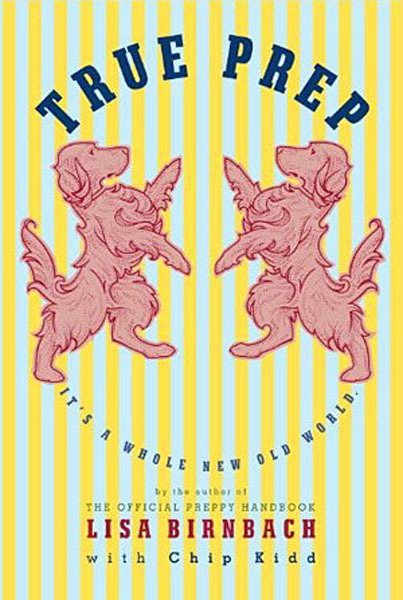 Matt Nelson interviewed Lisa Birnbach for Borders a few years back when True Prep was published, a book she co-authored with art director Chip Kidd. 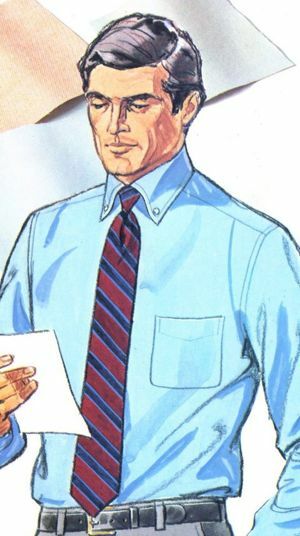 Birnbach also edited The Official Preppy Handbook, which was first published in 1980. PBS aired a fascinating documentary a few years ago: People Like Us – Social Class in America, taking on one of the most taboo topics in a democracy based on the concept that all people are created equal. The documentary explores the subtle and not so subtle distinctions about class that some people make in our culture, which have an impact on each of us every day. Do money and a privileged position in society determine class, or is there something more to it: manners, education, refined taste and a concern for the common good? What things make one class different from another? These are difficult questions to answer. Certain clothing designers, most notably Ralph Lauren and Tommy Hilfiger, have built marketing campaigns based on entrée into the upper class – or at least the popular imagination of it – launching the aspirational preppy movement. America is a meritocracy. If you have skill and talent, you can rise socially. You can gain admission to a first rate college or university, regardless of background. Witness Bill Clinton of working class origins, who gained acceptance to Yale Law School, making connections that helped put him in the White House. President Obama is another example of rising above one’s economic limitations and social prejudices, attending Columbia University and Harvard Law School, on the way to his history making election. 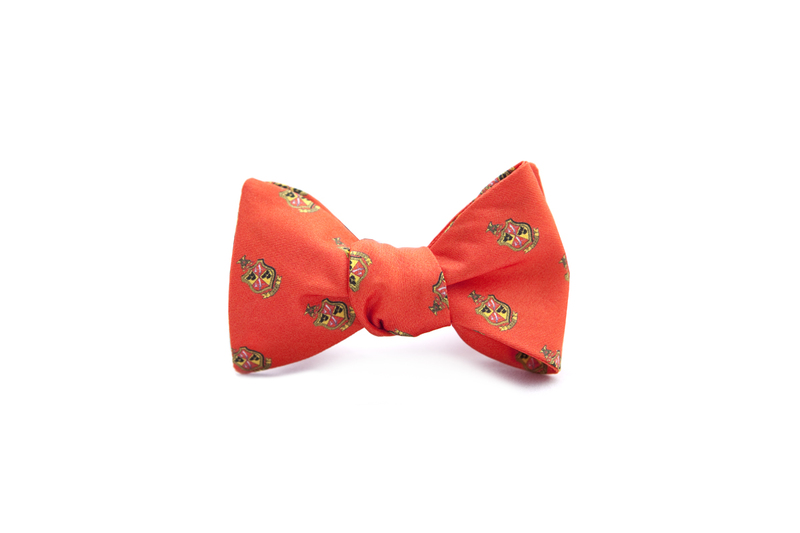 Part of achieving success in the workplace is dressing in a manner that creates the greatest opportunity for advancement and the least resistance, which is partly why books like Take Ivy and The Official Preppy Handbook have had such a lasting impact on fashion. For more clips from People Like us, visit the documentary YouTube page. 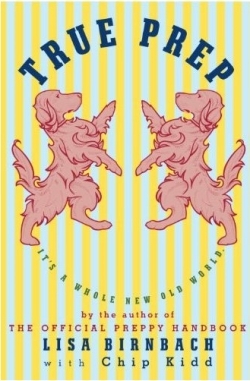 For a very funny critique of the aspirational preppy movement, check out Rob Lanham’s piece, “True Prep: It Is Not the Time for the Preppy New Testament.” He pays homage to Lisa Birnbach’s influential satire The Official Preppy Handbook, while remaining sharply critical of her sequel True Prep, which was published in the middle of an economic recession. In the last few days, I’ve been focused on New England, posting about Nantucket Reds and their connection with sailing. Today I found a YouTube video of two teriffic Boston Brahmin gentlemen bantering back and forth about their preferences in literature as well as their peculiar dialect, one associated with some of the original families in this country. The Brahmin presence in Boston dates back over 350 years. 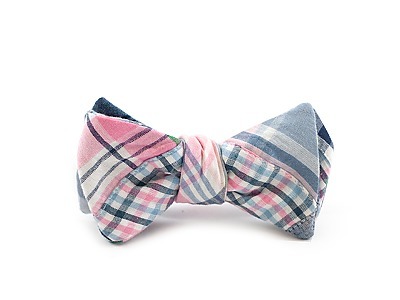 Many things preppy – including Anglophilia, a reverence for tradition and a thrifty, penny pinching approach – may be attributed to them. Their dwindling number is directly related to a greater inclination to discuss literature and the arts than to procreate. All of this somehow reminds me of the Cole Porter lyrics from “Anything Goes” with its Puritan and Plymouth Rock references. The Ella Fitzgerald 1956 version – my favorite – is posted below.